Thank you for visiting our website. It was created by Helipistas, S.L., inscribed in the Mercantile Registry of Gerona, Volume 1120, Folio 27, Section; 8, Sheet GI-20179 and C.I.F. B-17530684, and from now on, in this text, Helipistas. We have set some standards to ensure that it is informative and useful for anyone who visits it. Since we can make changes or change from time to time, we recommend that you visit this page of our website whenever you access it, in order to inform you of the rules in force at any time. By accessing our website, users agree to act under the conditions set out below. The use of this website presupposes the knowledge that it may contain information, communications, software, photos, videos, graphics, music, sounds, images and other materials and services (hereinafter “content”), and that this content is normally Supplied by Helipistas or licensed by independent content providers. Users agree and know that Helipistas allows access to this content, but that it is protected by the laws of intellectual and industrial property (hereinafter “rights”), as well as that these rights are valid and are Protected in all the means that exist today or that develop in the future. Consequently, the user accepts that his use of the content is subject to and is governed by these rules, in addition to the applicable laws and private property laws. All content on the Barcelona Helicopters website is protected by the rights and Helipistas owns or, where applicable, the licensee, the same; For this reason it is not allowed to modify, publish, transmit, participate in the transfer or sale of, reproduction, creation of derivative works from, distribution, exhibition, exhibition, or in any way exploit any of its contents in part or in its whole. 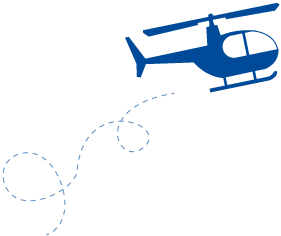 It is forbidden to establish a link with, or with mail content from, any URL to the Barcelona Helicopters website without the express permission of Helipistas. If you have any questions or suggestions, please contact the webmaster. Helipistas has no control over the people who can access your website or its whereabouts. Although Helipistas is aware of this, it does not mean that it is submitted to the jurisdictions of foreign countries, in case of conflict or claim in relation to this Web, will therefore be the courts and tribunals of the city of Barcelona (Spain) The only competent ones. Helipistas is not responsible for the verisimilitude of the information provided by third parties and included directly or by link in this Web. The consultation on any content of the web of Barcelona Helicòpters will not constitute in itself any type of contractual relationship between Helipistas and the user. Helipistas is committed to make its best efforts to avoid errors in the contents that are shown on the web. In any case, Helipistas is exempt from any liability derived from possible errors in the contents that may appear in the same. Barcelona Helicopters is a registered trademark. All rights reserved. Any other brand or product name mentioned in this website is an intellectual or industrial property right registered by Helipistas. Reproduction in whole or in part without permission of the owner. Helipistas can make as many technical modifications as necessary to improve the quality, performance, efficiency of the system and connection to telematic networks or Internet. Helipistas reserves the right to modify the information contained in the Web without prior notice. Helipistas is especially exempt from liability for service deficiencies attributable to the server center or connection networks, and from malfunctions that any computer virus may cause. Our users are committed to use the contents and services of the web in accordance with the law, the present general conditions and the particular conditions of the services offered by Helipistas at any moment. Not to disseminate contents of a racist, xenophobic, pornographic, terrorism apology and / or that violate human rights. Do not carry out illegal activities or constitute a crime, contrary to good faith, morality, public order, or uses, and / or activities that constitute a violation of the regulation on intellectual property or any other applicable legal rule. Do not transmit your username and password to unauthorized third parties. If an unauthorized user accesses the web with their data, they must immediately notify Helipistas. Helipistas is the owner of the database that collects the personal data provided by the users themselves and undertakes to comply with the obligation of secrecy of personal data and their duty to treat them with confidentiality. In order to guarantee it, it will take the necessary measures to prevent its modification, loss or unauthorized access, taking into account at all times the state of the technology in accordance with the provisions of the legislation on personal data protection applicable in Spain in every moment. The user accepts that the personal data provided at the time of requesting or contracting any of our services are included in an automated file, the ownership of which corresponds to Helipistas, in order to provide the requested service, and to provide any information that may Be of your interest on featured products or novelties. The user will respond, at all times, of the truthfulness of the data provided and will be responsible for communicating to Helipistas any modification in the same, reserving Helipistas the right to exclude from the services registered to any advertiser that provided false information, without prejudice of Other actions that proceed in law. The user may exercise at any time the rights of access, modification, opposition and cancellation of personal data by sending an email to [email protected]. On the occasion of the entry into force on May 25, 2018 will be directly applicable the General Data Protection Regulation (RGPD or the Regulation), we want to send you all the information on how we will treat your data and we will preserve your rights. Helicopters Helicopters S.L. with registered office at Heliport de Ullastrell s / n 08231- Ullastrell, Barcelona. The Delegate of Data Protection (DPO, Data Protection Officer) will be responsible for compliance with the regulations on data protection of the clients of the Brokerage. These are the communication mechanisms with the person in charge of data protection: [email protected] or to the postal address: Heliport de Ullastrell s / n 08231- Ullastrell, Barcelona, ​​Spain. We need to access your data to gather the necessary information to offer our services in the way that best suits your needs. Therefore, we use your data for the correct execution of our contract to provide services with you. Right of Access to know and obtain information about your data. Right of Rectification or, what is the same, the right to be able to modify incomplete or not exact data. Right of cancellation. The deletion of your data. Right of Opposition: you can request that your data not be used in certain cases, for example, receive advertising or newsletters, etc. Right to portability. You can request that your data be transferred to another entity those data that you have provided us through our professional relationship. Right to oblivion. The one that permanently and totally eliminates the data that is in the possession of an entity. This web has been developed for a minimum screen resolution of 1024 x 768 pixels. The optimal visualization of this Web is achieved with resolutions of 1024 x 768. The Web contains some playful elements made with Macromedia Flash. For the correct visualization it is necessary the player Flash Player 8, at least. You can download it from the Macromedia website. It is not necessary to install any other plug-in for the correct visualization of the Web.